I love the Holiday season, from Thanksgiving and right through to New Years Day. With Thanksgiving, I love the feast, the traditions, family, friends and being thankful for our blessings – no matter how big or small. 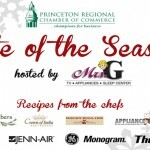 Each week throughout this holiday season, I will be posting recipes and tips to Live Better and Cook Better! One of the best ways to be able to enjoy the holiday, whether you are the host or guest, is to be prepared and do what ever you can in advance. 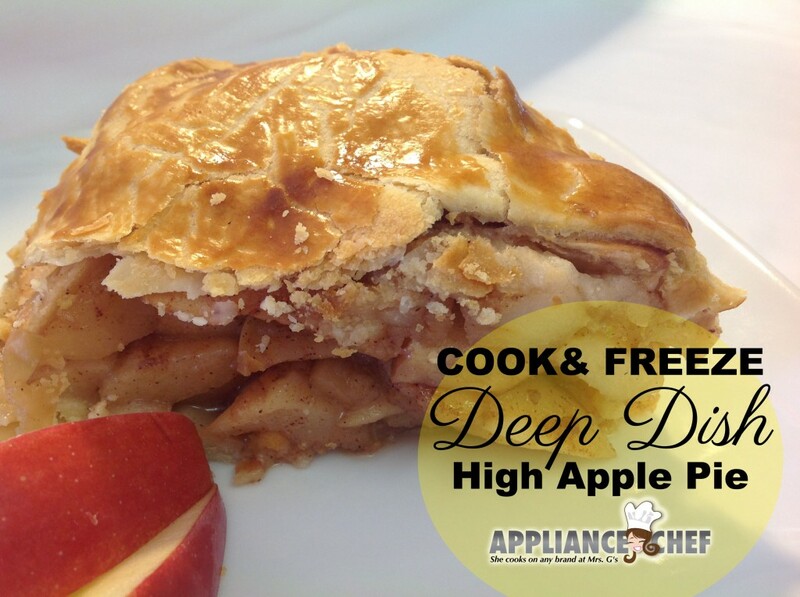 This week’s recipe for Traditional Deep Dish High Apple Pie is a Thanksgiving must! 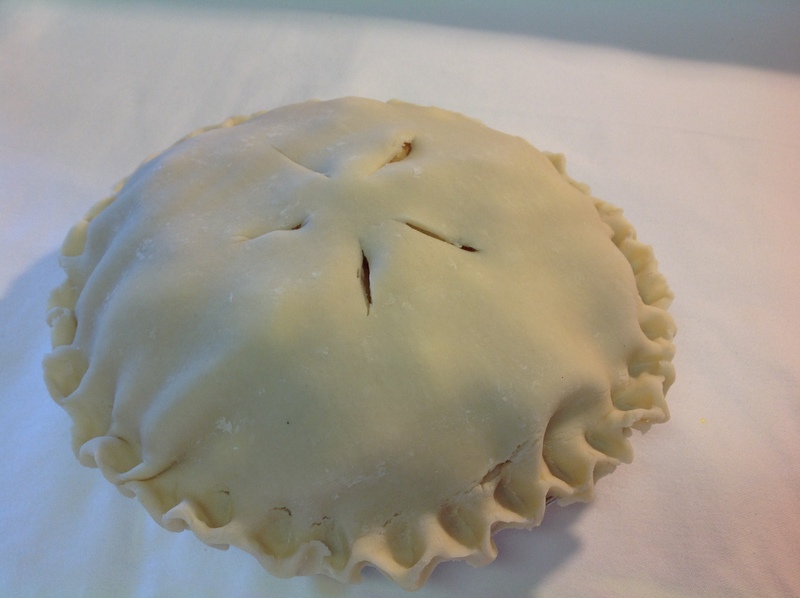 Fruit pies can be made and frozen up to three weeks in advance. 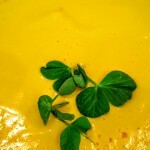 Some other great menu items that can be made and frozen are: Butternut Squash Soup, Fresh Cranberry Relish, and Pumpkin Cheesecake. The trick in choosing what menu item to prepare in advance and freeze is find out what takes the most time and uses the most utensils, if that dish can be frozen, do it! Making these dishes in advance not only trims Thanksgiving Day preparations, but also clean up time. Once you have prepared your recipe, take no short cuts in getting it to the freezer. Cooling a dish to room temperature is especially important; placing hot food in the freezer could raise the freezer temperature to unsafe levels, promote bacteria growth and defrost other foods. Wrapping the food or container properly is crucial to preventing freezer burn – which can ruin the flavor and color of foods. Wrap all foods in plastic wrap from the bottom and over the top, seal it well, then wrap again in foil to cover the top and sides tightly. To avoid punctures, be sure to use heavy duty aluminum foil. Alternatively, you can freeze food in zip top freezer bags, one inside the other for double strength. 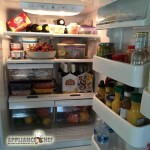 When storing bags of food in the freezer, lay them down flat so that the food is in a thin, even layer. This helps the food defrost evenly, too, a key to preserving texture. Successfully freezing food is only half the equation. Unless you properly defrost, it’s texture could be ruined. The best way to defrost is in the fridge. It is better for the consistency of food and better for health purposes, since it eliminates the risk of bacteria growth. Defrosting slowly in the refrigerator keep ice crystals from cutting into the food. Ice crystals can be sharp and if you defrost rapidly, they can cut in the food and harm texture. That is why fish sometimes has that mushy consistency when you freeze it. Now that you’re ready to make your pie in advance, enjoy this recipe below and let us know if you make it too! Apple Pie is a Thanksgiving Tradition in our house, and this is my favorite Traditional Deep Dish High Apple Pie. The trick to a nice high apple pie, where the crust does not collapse upon cooling - gently cook the apples first so that they do their reducing before they go in the pie. 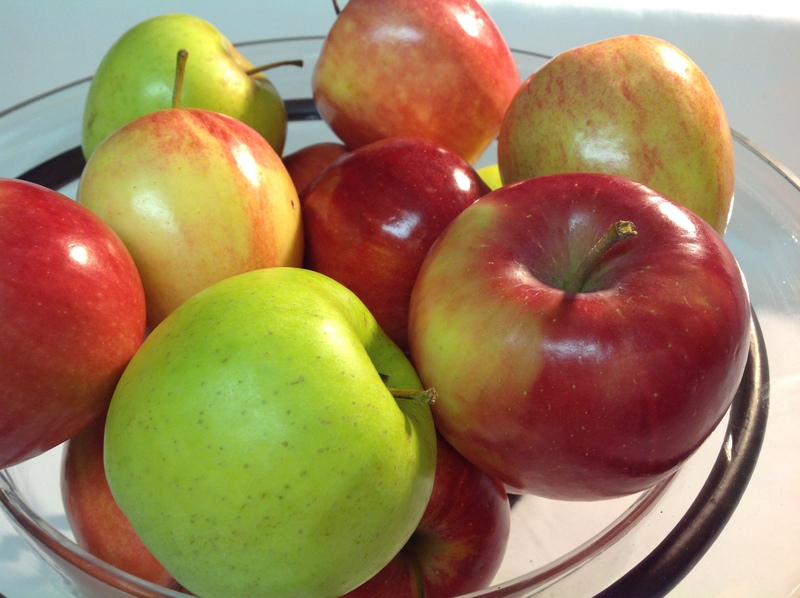 •	5 lbs of mixed apples (Granny Smith, Golden Delicious, Fuji, Braeburn, McIntosh), peeled and cut into 1/4 inch slices. 1. Dice the butter and return it to the refrigerator while you prepare the flour mixture. 2. Place the flour, ground almonds, salt and sugar in the bowl of a food processor fitted with a steel blade and pulse a few times to mix. 3. Add the butter and shortening. Pulse 8 to 12 times, until the butter is the size of peas. 4. With the machine running, pour the ice water down the feed tube and pulse the machine until the dough begins to form a ball. 5. Dump out on a floured board and roll into a ball. Wrap in plastic wrap and refrigerate for 30 minutes. 6. While the dough is cooling, start to cook the apples. Place apples in a large, thick bottomed covered pan or Dutch oven and cook, covered, over medium heat, stirring frequently, until apples are just tender when poked with a fork, but still hold their shape - about 10-15 minutes. Remove from heat. 7. 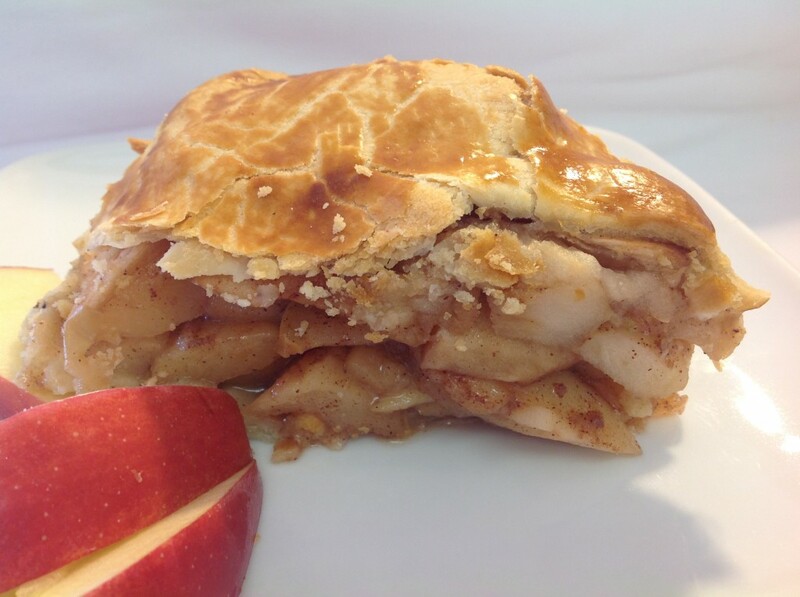 Measure the remaining filling ingredients - with the exception of the butter, and pour on top of cooked apples. DO NOT STIR it until they are ready to go into the pie or they will get too soupy. 8. 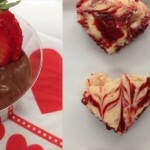 Remove dough from refrigerator, and cut in half. Roll each piece on a well-floured board into a circle, rolling from the center to the edge, turning and flouring the dough to make sure it does not stick to the board. Fold the dough in half, place in a deep dish pie pan, unfold to fit the pan. Repeat with the top crust. 9. Toss apples with other filling ingredients. Place apple mixture in the bottom crust. Mound the apples, using one hand to steady the mound and the other to add more apples to build it up. Dot filling with butter pieces. 10. Drape top crust over. Roll and crimp edge. Make decorative slits on the top of the pie for steam to escape. 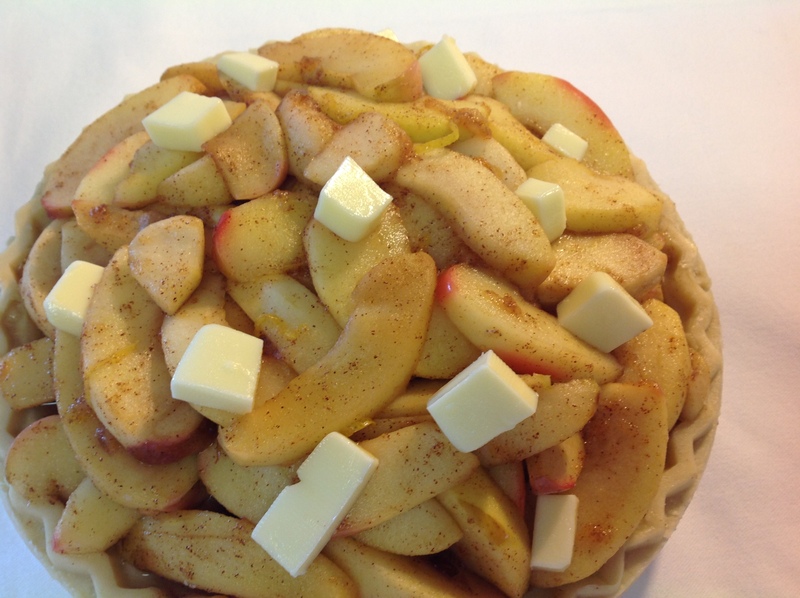 At this time you can double wrap the pie with plastic wrap and freezer for up to 3 weeks. Two days before Thanksgiving, remove the pie from the freezer and thaw in refrigerator for 24 hours. On Wednesday, you can bake the pie according to the directions below, as this pie tastes and serves best when it has rested for a day. 1. Pre-heat oven 450 degrees. 2. Whisk together 1 large egg yolk and 2 tablespoons of water, using a pastry brush, lightly brush top crust of pie with egg wash and sprinkle with granulated sugar. 4. Reduce oven to 350 degrees, rotate pie, and continue baking until crust is golden brown and juices are bubbling, about 1 hour (tent with foil if crust is turning too dark). 5. Remove from oven and transfer to wire rack to cool completely before serving.